If you are lucky enough to not have to worry about the neighbors, and live in a home where the piano can be in a relatively large room, It will sound best if the room has hardwood floors rather than broadloom, but the piano should still be sitting on castor cups. If you think that you may need to shift the piano’s position every once and a while, you could arrange to have the pianos metal wheels replaced with rubber-wheeled castors, although this detracts a bit from the look of a grand. One more important fact about the piano’s “wheels”: They are not made for rolling the piano around, they are designed for small movements only; pulling an upright away from a wall, shifting a grand a few inches to the left or the right. 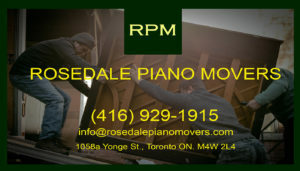 If you want the piano to be truly movable, it must be fitted with proper rubber-wheeled castors, or in the case of a grand piano, either a tripod or leg dollies. If you do have to shift an upright, there are handles on the back for one hand, and the other hand should be on the front of the keyboard. Never push an upright piano backwards holding the piano near the top: It could tip backwards causing injury to yourself, or worse, to the piano. If your piano has free front legs that are not connected to the bottom of the piano, try to lift slightly on the keyboard as you move. These legs are known to snap off, toppling the piano forward. If you have to shift a Grand, it’s highly recommended that you use three strong people: two on each side of the keyboard, and one big brute on the tail end. Be very carefully if running over carpet, or bumps on the floor. It is not unheard of for one or more of the legs to snap off, bringing the piano crashing to the floor. 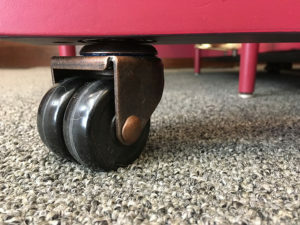 Paul Hahn & Co. can change your old, floor-chewing castors for nice, new rubber-wheeled ones – Prices range from $100/per castor and up – installed!